When I sat down to play Defense Grid 2, I can’t say I was particularly excited or intrigued at the thought – I’d not played the original and had only a brief encounter with its sequel at this year’s E3, which left me with a very average impression. I’d played tower defence games in the past, such as Revenge of the Titans, Plants Vs Zombies and similar titles and they’ve entertained me (to a certain degree) although, ultimately, I’ve become annoyed by the difficulty curve or because the formula has turned stale over the course of the game. The aforementioned games are great games, they’re just not as gripping as a role-playing game or first-person shooter for someone like me. After an hour or so of play, I found myself towards the end of the second level in Defense Grid 2, when a penny (of sorts) dropped and I realised that I’d achieved the optimal state for this game by essentially creating a grid that could not be bested by the current swell of opposition. I fast forwarded the action and watched a symphony of destruction being conducted by all the ground work I had laid. Boosted by a confident win, I marched onto the next level and promptly got my face kicked in by a superior opposition and poor planning. 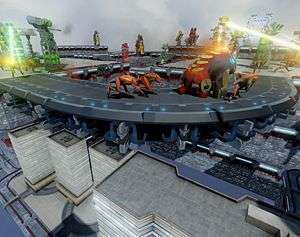 Welcome to Defense Grid 2. Defense Grid 2 has a pretty entertaining story for a tower defence game, seeing as a story isn’t typically one of the most crucial elements in this genre. I’ve called it entertaining because it’s a little bit ‘out there’ in as much that I’m not totally sure what’s going on or what we’re doing. Anyone looking for a highly involved story may be disappointed, but there is enough meat on these bones in order to formulate some degree of interest. The basic premise that you’re moving around the universe, seemingly setting down on random planets and space stations to battle aliens may seem a little odd but, with the inclusion of your AI friends that you pick up along the way, the slightly wayward story doesn’t seem so bad in the overall game. Your AI counterparts flesh out the story, the aliens, and the various problems you encounter and it is, frankly, a godsend that these personalities are both well written and likeable, if not a little cheesy at times. The slightly wacky story carries over to the presentation, which isn’t always a good thing. The menus are easy enough to navigate, but by Christ, there are a lot of options right from the get-go. There are four different menus that have between ten to fifteen different options for you to choose from. It’s honestly a little overwhelming, and without a good look around you’ll miss out on swathes of information about how to play, a Wikipedia on aliens and weapons, as well as some other odds and ends. It’s like someone has taken a bucketful of good ideas for the menu screen, loaded them into a shotgun and fired it at the game. This isn’t a criticism as much as it is a bit of a shame, because there’s plenty of interesting information that can be overlooked here. Previous tower defence games I’ve played have employed different rules and concepts around their theme, however, Defense Grid 2 works with the theory that it should be down to the player to decide not only what towers they should use, but also using their placement in order to construct the most difficult path for the enemy to get to its target – it’s tower defence at its most basic, in that regard. 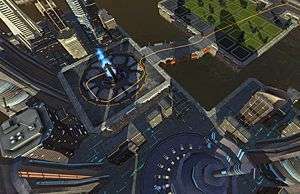 In Defense Grid 2 the target in question is a number of cores at a certain location on the map. Successful progression will revolve around ensuring at least one of these cores remains after the waves of enemies has ceased. 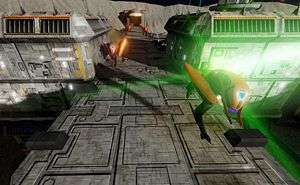 The game doesn’t hold your hand in the opening stages, aside from explaining a few basic systems, and largely lets you get on with it, throwing twenty waves of enemies at you in the first level alone. There isn’t any grace period other than a bit of chatter prior to each round starting, either. You’ve probably got around twenty seconds in which to construct a couple of towers to deal with the initial wave and, due to your limited resources at the start, it won’t be enough to make any sort of maze or deal with problems you may face in five or six waves’ time. At first I resented this lack of preparation – I wanted time to construct a masterpiece and then put it to the test, but part of the appeal of the game is thinking on the fly, making decisions that may very well end up being wrong. Gameplay is made up of these right and wrong decisions, essentially watching twenty minutes hard work either come into a beautiful fruition or get quickly flushed down the toilet. Your resources (which respawn automatically or at an increased rate, providing you’re killing aliens) allow you to build and upgrade towers and the Boost blocks on which they can be built. Boost blockers allow for increased elevation for towers and can also upgrade the tower placed on top of them, increasing damage or giving the Boost block different abilities. You can also upgrade each tower twice, increasing various attributes – for a price. The problem is deciding what to do and when, balancing the creation of new towers against upgrading old ones, the latter of which can be very expensive and therefore costly if done wrong. Getting things wrong isn’t the end of the world for two reasons and both are a credit to the game, overall. The first is that if you find you’ve played yourself into a dead end, rather than have to start again, you can wind the game back to the last wave of enemies that appeared, giving you the opportunity to make the subtle changes you failed to do first time around. It’s comforting for any newcomers to the series and also a good way to avoid pointless frustration over minor mistakes. At the end of the day, if you’ve royally screwed up, you’re going to have to restart, regardless, so allowing for some mistakes isn’t game breaking. Secondly, because the game moves at such a decent pace and is just so darn fun, that if you do have to restart it isn’t long before you’ll be back in the thick of it. In a typical twenty wave round, it will only be around wave eleven or twelve before you can settle down and ensure that everything is functioning at optimal levels – you’ve got to consider the maze you’re creating, the towers you’re placing, what you’re upgrading and the enemies that are charging towards your cores. Some enemies can gather more than one core and, if they manage to do so, will start charging back towards the entrance, through the defences they’ve already beaten once. Should they die en route, the cores will (thank god) start to hover back to their resting place, although if an enemy comes across them in the meantime they’ll just poach them from where they are. Luckily any aliens that decide to try their luck have to fight their way through an impressive arsenal first, and although Defense Grid 2 certainly feels like it’s resting on some tried and tested weaponry choices, it manages to keep things fresh enough that you don’t really mind so much. Fan favourites such as Gun, Inferno and Laser turrets are on hand to make up the backbone of your alien-destroying gear, while other interesting extras (which include the Meteor, Temporal and Tesla towers) work to add an interesting strategic edge as the game progresses. Experimenting with the different variations and choosing what works best for you is a large part of the fun in this game, and being able to go back a couple of beats and tweak your setup without having to start over is a big bonus. The aliens that make up much of the fodder for your variety of towers are pretty standard in terms of enemy units. There isn’t anything here that you’ll have not seen before in some sort of variety, and although that could be construed as a negative point it isn’t the biggest problem, because you’re ultimately designing your maze based on whatever comes flooding out of the level entrance. Some of the opposition will make you sit up and pay attention if you’ve not planned for their arrival (shielded enemies, I’m looking at you) but in terms of what they are and what they do, there isn’t anything to write home about here. While the aliens are both lacking in personality and visual appeal, there is some refreshing news as far as graphics are concerned. For a game that is based heavily in the realms of science fiction, there is plenty of colour on show to avoid the boring browns and drab greys that can be expected from such a genre. Each tower, depending on its rank, is coloured differently, each level is beautifully detailed, and some of the levels set in outer space have some lovely backdrops. The level of detail on the towers is also something that shouldn’t be overlooked, it’s just a shame that little touches like piles of bullets or discarded shell casings are missing. When you’re done with the campaign – which will likely see you happy for quite some time – there is a multitude of different challenges that can be applied to each level, different difficulty settings, a level editor and multiplayer – both cooperative and versus. There is simply tons of content if you love your tower defence games and only re-enforces the aim of Defense Grid 2 to become the definitive tower defence title. 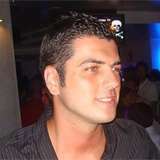 The multiplayer in particularly is something that will keep fans happy for some time, not to mention the level editor. Defense Grid 2 is certainly a peach of a game – it combines plenty of elements from other titles to make it a very impressive entry in its genre. It is unashamedly a tower defence game in heart and soul, not worried about trying to evolve the formula, instead focusing on refining it, and although that hasn’t paid off in every area, it is a very memorable title none the less. 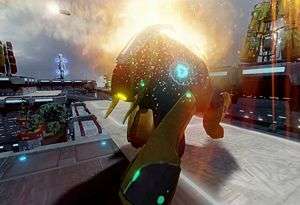 I will be playing Defense Grid 2 for plenty of time to come, and it isn't going to be easy to put down. I'm almost irritated that another game has made it onto my 'to finish' list, especially considering it's not one I thought I'd enjoy this much. Even if you're not a fan of the series (or even the genre) it's certainly worth having a look at. If you're a big fan of either, this is going to be a very strong title to slip into your collection. Look past the mediocre story and featureless aliens and focus on the good, because there is plenty to keep you busy. I really enjoyed the first game, right up to the point that the difficulty spiked and it felt like I’d ran into a cliff. I ended up giving up after a dozen or so repeated failures and never went back to it. Very frustrating. I plan on picking this up at some point, hopefully I’ll manage to finish it this time.